Water power has been first used by inventing waterwheels that had been used to power flour mills, it worked best on larger rivers and did not work well in the faster moving and less voluminous mountain creeks and waterfalls, while water turbines used wheels with cups rather than flat panels solved this problem. Nowadays scientists made a big jump trying to benefit from the water power to generate energy. When tides comes into the shore, they can be trapped in reservoirs behind dams. 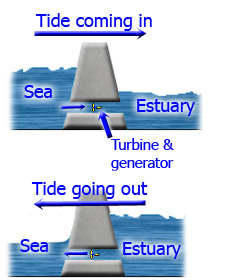 Then when the tide drops, the water behind the dam can be let out just like in a regular hydroelectric power plant. In order for this to work well, you need large increases in tides. An increase of at least 16 feet (4.8768 meter) between low tide to high tide is needed. There are only a few places where this tide change occurs around the earth. Can be used in different types, the first type is by using the kinetic energy that exists in the moving waves of the ocean, the wave rises into a chamber. The rising water forces the air out of the chamber. The moving air spins a turbine which can turn a generator. When the wave goes down, air flows through the turbine and back into the chamber through doors that are normally closed. The second type uses the up and down motion of the wave to power a piston that moves up and down inside a cylinder. That piston can also turn a generator. s temperature differences in the ocean as it gets colder in the deep than the surface. Power plants can be built that use this difference in temperature to make energy. A difference of at least 38 degrees Fahrenheit (3.333 Celsius) is needed between the warmer surface water and the colder deep ocean water. This type of energy source is called Ocean Thermal Energy Conversion or OTEC. BioWave and BioStream are two technologies to generate renewable energy by tapping the motion of currents within the sea. A third technology, called BioBase, serves as a mooring system, for bioWave and bioStream. Plant-shaped blades imitate the motion of ocean sea plants in order to absorb maximum power from sea currents. 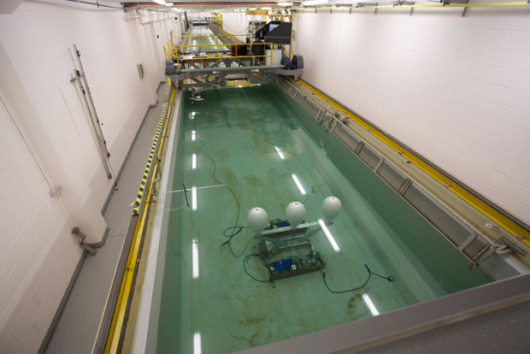 The blades lie flat on the sea bed during extreme currents. While the bioStream system has a rotating arm and flexible fin attached to a fixed pole. Passing currents drive the arm and fin and, an electrical generator. Hydroelectricity comes by using potential energy of flowing water. At waterfalls and dams gravity pulls water downstream, where it turns the blades of a large hydroelectric turbine which turns the generator rotor, and that creates electricity. Another smaller hydroelectric plants use straight river flow and do not involve dams. Other models that are micro-generators use ordinary streams to generate power.